1) The difference between earning money and making money. 2) Seeing the different aspects of earning and making money by looking at the differences between being an employee, being self-employed, owning a business and being an investor. For those of you who have read our suggested books, you’ll recognize this activity as Robert Kiyosaki’s Cash Flow Quadrant information. This activity is a great way to show kids where their money is going to come from using the four quadrants. Note: I am often asked to do short presentations (usually 45 minutes or so) for career fairs and volunteering at high schools to share what I do for a living (entrepreneur). I never miss these opportunities to introduce the students to the quadrant and teach them the difference between earning money (trading your time and energy for money but only getting paid once for your time) and making money (trading your time and energy to get paid over and over and over again). Most adults don’t even understand the difference between earning and making money, but when they do? Boy do they start seeing things differently in terms of how they bring money into their lives. 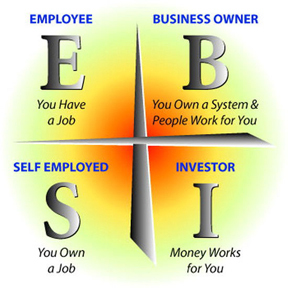 Here’s a great video by Robert Kiyosaki so you can learn about the quadrant before you teach it to your students. What you have below is the Lesson, the workbook pages from our Financial Freedom Playbook and a video related to the activity.